Check out a few of our favorite moments and gadgets coming out of CES 2018! The Aeolus Robot, equipped with an agile arm able to dynamically manipulate household objects, can recognize and adapt to changing environments and independently learn, navigate and complete tasks – like vacuuming or grabbing a drink from the fridge. Made up of 90 concave and 156 convex 4k OLED displays, LG’s OLED Canyon created a fully immersive visual experience with its walls displaying glaciers, waterfalls and other scenes of nature. Yi Technology’s YI Horizon VR180 Camera, designed to leverage Google’s new VR180 format. The 3-D camera allows users to capture high-resolution, immersive video that lets anyone in on the AR experience. Yamaha Motor’s autonomous motorcycle-riding humanoid robot, MOTOBOT, controls six actuators (steering, throttle, front brake, rear brake, clutch and gearshift pedal) to autonomously operate the vehicle. 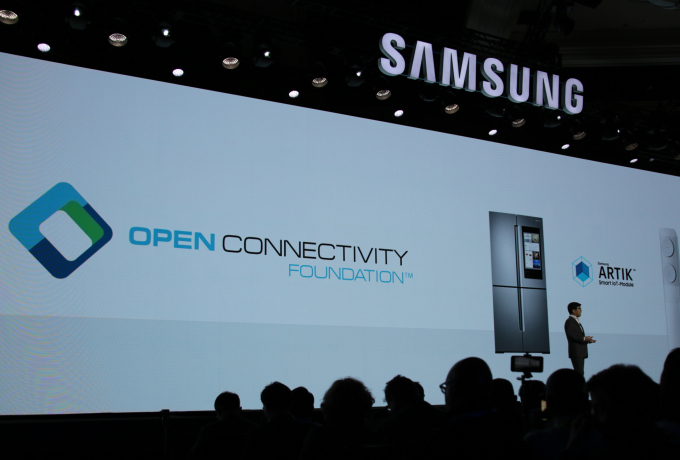 The Open Connectivity Foundation and its member companies demoed cutting-edge smart home products in a completely interoperable living room and kitchen, as well as in a healthcare-oriented in-home aging use case, showcasing how smart devices from multiple vendors can all communicate through OCF’s open source framework.